Some jobs that you do outside the house aren’t always on ground level. Further, you might require a ladder that allows you to reach a higher level or higher floors if you are working on a commercial job. For this reason, learning how to use an extension ladder, and properly setting it up to avoid injuries when completing different tasks. These are a few simple steps to help you properly set up the extension ladder, in order to be able to reach the higher levels you are working on, and in order to ensure you do not get injured when working on the ladder. Before even setting up the ladder, you should make sure that it is closed. Doing this will avoid injuries, such as your finger getting caught up on the rungs, or other parts, when you are opening up the extension of the ladder. The fly section of the ladder should be at the lower end, meaning that you should place it on the floor where you are going to open up the ladder. The fly section of the ladder is the side that actually moves. You can test the ladder, or you can extend the area of the ladder to make sure you set up the right side of the ladder on the ground, and avoid injuries or damaging the ladder when laying it out. When setting up the ladder it is important to extend it at least three feet up, beyond the point required for the job that you are doing. This will allow you to lock the rungs in to place, so that the top part of the ladder does not slide down when you are erecting it for the job. From there, you should lay the ladder firmly on the ground, and place the base firmly against the wall where you are going to be doing the job. Once you have set the base up against the wall, you should go to the top of the ladder and lift it up off the ground. You should get below the ladder and gradually walk towards the wall, slowly raising the ladder of the ground as you are walking below the rungs. Doing this allows you to set the ladder up at the perfect angle, and also allows you to set the ladder up at the position that is most comfortable for you as you are working with the ladder. When setting up the ladder, it is important to foot the ladder so that the bottom does not kick out. This will not only cause the ladder to fall if it is not properly grounded on the floor before you do climb up. When working on your own, you should place the ladder on a secure structure or building before lifting it up, not only to stabilize the base, but also so you can extend it to the ideal position when setting up the ladder. At this point you should lift the base of the ladder and move it away from the wall, in order to ensure it is set up at the proper angle and height before you step up on to the ladder. When you are setting up the distance of the ladder, it should be set up at a distance away from the wall that is 1/4 of the extension ladder’s height. This not only guarantees the ladder will not slide down or slip when you are climbing up of it, but it is also going to place you at the perfect location for the job you are going to do once you have climbed up the ladder. If you are working on a position of the home or other commercial job that is twelve feet off the ground, the base should be set up at about three feet away from the home in order to avoid falls or other injuries when you are working on the ladder. Once the ladder is set up at the perfect position, you should climb the ladder slowly, one rung at a time. If you have anything in one hand, then walking up slowly holding on to the rungs is the best way to climb up. If possible, you should use both hands while climbing up the ladder, in order to ensure you do not fall off, or miss a rung while you are climbing up the ladder. It is also important to face the wall that the ladder is leaned up against (face forward), to avoid injuries or avoid falling down when you are climbing down the ladder. If you are working on gutters, it is a good idea to foot the ladder at the base of the home in order for it to be stabilized, and in order for you to be able to move the extension parts of the ladder. When climbing down, it is also important to climb down one rung at a time. If possible, try to avoid skipping steps, so that you do not fall or injure yourself when coming down. 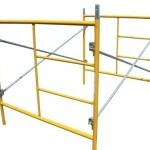 It is also a good idea to place both hands on the sides of the ladder, so that you do not trip or fall when coming down. Depending on the make of the ladder, the directions for setting it up might differ a little, but in most instances, the steps for setting it up are the same with most ladders. As long as the ladder is properly set up, and distanced away from the structure that you are working on, you should not experience any difficulties climbing up or down, and you should minimize the number of accidents and injuries that do occur when working on the ladder. It is important to ensure the ladder is secure, and that the rungs are locked in to place before stepping on to it; this will not only make it safer to climb up, but also make it easier for you to work on different projects where you will be on top of the ladder.